1. Bill Clinton out-earned the average S&P 500 CEO in 2011, taking in a total of $13.4 million for giving 54 speeches last year, at an average of almost one-quarter of a million dollars per talk. The former president's 2011 earnings were slightly higher than the $12.94 million earned last year by the average CEO. 2. U.S. car sales rose last month to a five-year high for the month of June, as total light vehicle sales increased by more than 22% compared to June of last year. The 14.08 million units sold (seasonally adjusted at an annual rate) last month was the highest sales level for the month of June since 15.77 million units were sold in June 2007. On a year-to-date basis, sales during the first six months of this year of 6.3 million vehicles are almost 15% above the same period last year. Recession? This volume of activity for new car sales in June and sales YTD is certainly not consistent with an economy teetering on the edge of a recession. Update: See chart below of the percentage change in car sales from the same month in the previous year. 3. June real estate reports are just starting to come in, and Nashville is reporting a 21% increase in June home sales compared to last year, and a year-to-date increase of 24.5% compared to the first six months last year. The average price for a Nashville condo sold in June increased almost 7% over last year, while the average home prices rose by 3.2%. 4. A new report highlights a significant gender gap in reading in favor of girls for U.K. high school students. On standardized tests, only 59% of boys score at a passing level, compared to a pass rate of 73% for girls. 5. Barack Obama's re-election odds on Intrade have been rising for the last two weeks and have increased now to 56.3%, the highest level since May. Meanwhile, Romney's Intrade odds have been falling, and are now below 41% for the first time since May. This volume of activity for new car sales in June and YTD is certainly not consistent with an economy teetering on the edge of a recession. If the economy is "cratering", no one's told the consumer. Yet, we've had a weak recovery from a severe recession. It's less than an L-shaped recovery when compared to potential real growth of 3% per year. Real growth has slowed to 1.7% in 2011, and likely slowed even further in the first half of 2012. The Big Three US car manufacturers have reported strong domestic sales for June, capping a solid first half of the year even as US economic growth overall remained weak. "High auto sales volumes in June can be attributed to pent-up demand, some targeted incentive programs, low interest rates and falling gas prices," said Michelle Krebs of industry specialists Edmunds.com. "There was great pressure from automakers to close June strong, especially after the unexpectedly weak Memorial Day holiday weekend in May," added Edmunds's Jessica Caldwell. "It is the end of a quarter so undoubtedly they wanted to finish big. Two weak months in a quarter would make for unfavorable reporting." With both consumer confidence and sentiment declining in June, shoppers’ caution has translated to their wallets. U.S. retailers will release their final results on Thursday. A survey by the International Council of Shopping Centers and Goldman Sachs showed customer traffic slowed, with the highest percentage of consumers saying they didn’t shop at all during the past week since late May. The market has staged a recovery on the fervent hope that Europe has finally found the mythical free lunch. Obama is riding that wave (frankly the free lunch is his favourite). Of course, Obamacare is going to impose a 3.8% medicare tax on all investment income starting in January. Also, the Bush tax cuts expire, so dividends will now be taxed up to 39.5% and LT cap gains will go to 20%. The minimum tax on LT gains for an AGI over $250K will now be 23.8% and on dividends it will be close to 44%. Asset prices need to adjust downward to maintain the required yield. So we have that to look forward to. Munis have rallied in anticipation. Recession? This volume of activity for new car sales in June and YTD is certainly not consistent with an economy teetering on the edge of a recession. Recession or not very old and inefficient cars have to be replaced. Mark keeps looking for all of the good news that he can find but ignores the reality and fails to connect the dots. Let us see how well his optimism works out over the next year or so. The Intrade numbers intrigue me. My money is still on Obama for reasons previously stated in other posts, but I am a little surprised the gap between the two is so large. I am expecting a closer race come November. Fear not. The GOP campaigns thoughtlessly and aggressively, while the D_party campaigns like sissies on the defensive. This plays to GOP favor. Romney may win---and usher in huge federal deficits, a new war somewhere and maybe even Romneycare. Of course, renewable energy will remain the centerpiece of the real federal energy policy---pro-ethanol. "Romney may win---and usher in huge federal deficits ..." -- "Benji"
Intuit is reporting stronger job growth for June among small businesses. They also revised the May job figures higher. Is this mere crass vote buying financed by extorted tax dollars or is there a real need for this so called 'safety net' program? Well that might all change because of what happened on June 28, right? No matter the situation there is clearly no need for extortion to fund the program. Food stamps is no longer a safety net. Safety nets should not extend into the middle class. I make just about median wage, but I qualify for food stamps. But none of that disproves what I said. Consumer spending (adjusted for inflation and excluding autos) is at record highs and growing about 2.5% per year. Furthermore, that pace of growth is rising and trends within consumer spending indicate further acceleration is likely in the near term. So, if the economy is cratering, no one has told the consumer. Recession? This volume of activity for new car sales in June and sales YTD is certainly not consistent with an economy teetering on the edge of a recession. Even in Oct 2001, right after 9/11, 21.7 million were sold. 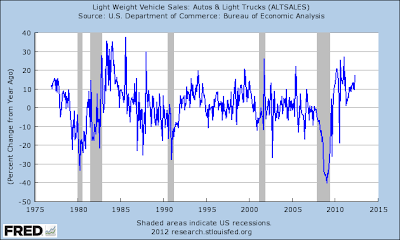 In other words, auto sales is quite a poor indication of a recession ahead or even being in a recession. If you look at the y-o-y rate of change you can see that auto sales drop below year-ago levels during/prior to a recession. Historically, this holds true, too. Are auto sales the best indicator? No. but they are just another indicator of the hundreds of thousands pointing up. I don't know for sure (I don't have the data in front of me), but I'd suspect the monthly numbers you posted are rising due to seasonality. Consumer spending (adjusted for inflation and excluding autos) is at record highs and growing about 2.5% per year. First of all, spending without savings to pay for it may not be a good thing and is not an indication of a healthy economy. Second, you may be correct if the inflation adjustments were actually correct and meaningful. They are neither. See updated post with a chart of year-over-year car sales back to the 1970s. another indicator of the hundreds of thousands pointing up. And very likely even more hundreds of thousands pointing down or level, when adjusted for inflation - or better yet, real inflation. The apparent current auto sales recovery also reminds me greatly of the back to back recessions in the early 80s. It sure looked like a recovery after the first recession -- and then *boom*. And recessions and slowdowns *always* occur after substantial drops in total money supply growth, as are going on now in the US, Euro area, China, etc. Most of the drops in money supply growth is due to the expiration of the various countries quantitative easing programs. Money supply was much higher than it should have been, so the drop is nothing more than the money supply rate reacting to the withdrawal of Q.E. Money supply stopped being a reliable indicator of economic activity after QE I. Given its artificial manipulations by various countries the world over, the money supply is hardly indicative of economic activity. At my company, we study the money supply very closely for the reason you just specified: its fluctuations are closely related to economic activity. However, what we found is the money supply become unreliable after the Fed intervened: in 2010/2011, when the economy was slowing its rate of growth, the money supply was indicating accelerating growth. Had we followed that indicator and ignored all others, we would have missed the period of slower growth for one of accelerating growth. Just as now, the money supply is indicating slowing/negative growth, when all other leading economic indicators (as well as economic activity in general) is growing at an accelerating pace (the pace began to reaccelerate year-over-year in April). So, needless to say, money supply is not reliable any more. At least, not until the manipulations stop. Same thing with corporate bond prices. There is some truth in all of that, but nothing contradicts recessions and slowdowns *always* occur after substantial drops in total money supply growth, as are going on now in the US, Euro area, China, etc. Money supply is not reliable anymore?, after it has been 100% reliable for decades if not centuries. That's just saying it's different this time, and you know how extremely dangerous that is. Plus, having the correct or at least a closer definition of total money supply is critical. I submit that things like QEx need to be added in, as well as lags, velocity, credit, debt, debt deflation etc. Looking at in 2010/2011 in that way did not give false signals. When one looks at the true and grand total picture, total money supply remains the best overall predictor in existence - and it is shrinking worldwide. Given its artificial manipulations by various countries the world over, the money supply is hardly indicative of economic activity. By the way, I never said or even asserted that it was indicative of true economic activity - but things like NGDP are *way* over rated. What I did say is that inflation adjustments, or better yet *real* inflation, make the current picture a lot more real and accurate than unadjusted data. I still submit that hundreds of thousands of the stats are level to down after an inflation or real inflation adjustment. Auto sales "the best in five years" may not indicate a new recession coming -- but the best-in-five-years being 11% below five year ago shows how far we are from being recovered from the last one. Paying interest on reserves changes everything. The Fed has said this itself. So does having interest rates near zero, which causes velocity to plunge and the money base to explode, yet still possibly be at only deflationary level (see Japan). One simply can't count up the old money measures as we used to. That said, all the indicators are that money is "tight". Indicator #1 is that prices *fell* in May. Deflation -- the price of money rising relative to everything else, resulting from the supply of money not keeping up with demand for it -- is pretty much the definitional proof of money being tight. And tight money is not good for future growth. All due respect, Bart, but not realizing when a leading indicator is providing a false signal can cause you to jump at shadows. You may miss recessions or see them where they are not. Historically, money supply has been a fantastic economic indicator. But in this business cycle, it is missing the mark. This is why it is so important to monitor a system of leading indicators, not just one. If we just follow money supply, we're looking at a recession. But when we monitor it along with other leading indicators such as the USLI, PMI, business-to-business activity, retail sales (excl autos), the Chicago Fed national Activity Index, construction, and wholesale trade and money supply is the ONLY indicator showing recession, then we must determine something is throwing it off. "Remember that the press corps still hasn’t asked [Bernanke] about his 2003 claim that money and interest rates are unreliable policy indicators, and that only NGDP growth and inflation provide a reliable indicator of the stance of policy. "And that those two indicators (averaged) show the tightest money since Herbert Hoover over the past 4 years." This is the US Industrial Production annual data trend (a 12 month moving average). This smooths out seasonal volatility and accounts for 1-month anomalies. It also has the benefit of being coincident to GDP (USIP 12MMA enters a recession at the same time GDP does). Furthermore, it has the benefit of being monthly and revised a lot less than the quarterly GDP report. This is the year over year growth rate of the USIP data trend. (The most current 12 months compared to the same 12 month period last year). Again, this has the benefit of being monthly and coincident to GDP (when GDP falls below year-ago levels, so does USIP). What we clearly see is this: USIP (and thus the US economy) is growing at an accelerating pace. In other words, if the US is facing a recession, no one told the economy. That is an explanation. Not sure how much we can attribute the rise in Sales to this, though. Food stamps account for about 14% of the population. Food expenditures account for about 6% of consumer spending. Given those relatively small numbers, that cannot be the driving force behind the rising Retail Sales. >>> 5. Barack Obama's re-election odds on Intrade have been rising for the last two weeks and have increased now to 56.3%, the highest level since May. Meanwhile, Romney's Intrade odds have been falling, and are now below 41% for the first time since May. This country is doomed. Doomed. If those are the two choices you are damn right that it is doomed. Both are proponents of big government, big deficits, and militarism. Both are for the Patriot Act and against individual liberty. Both are in favour of the Federal Reserve devaluing the money. If we just follow money supply, we're looking at a recession. I (mostly) rest my case. We could go on for many many posts trading stats & indicators back & forth, you the optimistic side and me the pessimistic. And there are very many that are indicating recession ahead. I continue to submit that there are more going down or level than are going up, and offer the fact as proof that you continue to (with all due respect) avoid the inflation or *real* inflation issues. I believe that you're looking at many false signals due to not taking *everything* into account. This is the US Industrial Production annual data trend (a 12 month moving average). As I noted earlier, that is trumped by the many times historically that Industrial Production was at a somewhat high level preceding a recession. And your YoY trend has been down since early/mid 2011 too. And far from just the food bill. Something about unemployment comes to mind as well as huge drops in tax rates - and much more. And then we have the fully corrected inflation rate issue on retail sales, which shows it looks quite poor. Bingo, although I'd still call it disinflation or relative deflation. Things like health insurance are headed up, big time. The most recent YoY change rate per the BLS itself is over 13%. Well, yeah. Everything is at high levels preceding a recession. Everything needs to rise before it falls. Yes, the economy was growing at a slower pace during 2011 and into the 2nd quarter of 2012. That trend has reversed itself . You are right though, Moe, that we could keep going back and forth until Judgement Day. We both have a mountian of stats to make our case. Should we each have one more say (a Last Word, if you will) and declare a cease fire? You rest your case on a currently bad indicator? All due respect, that gives me reason to doubt your inflation calculations, too. Really? The inflation calculations simply use the pre-Boskin methodology. That allows a fair comparison with previous periods because the change of methodology was not applied to the older data. I think that you have an apple/orange problem without realizing it. Of course, but as I noted above the IP YoY trend has been falling since early/mid 2011, and is at best level now. New Orders has crashed (lowest since 9/11), employment continues in a down trend, same with prices paid (aka, disinflation as total money supply shows). I continue to believe that you're looking at many false signals due to not taking inflation and especially real inflation (not all that different than what has blown up recently with LIBOR) into account. 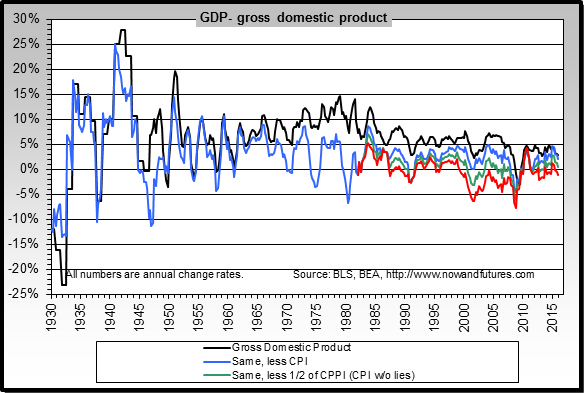 And Real GDP with a full correction is still negative, same with Real GDI and Real GNP. The inflation calculations simply use the pre-Boskin methodology. Plus they don't account for reverse hedonics. 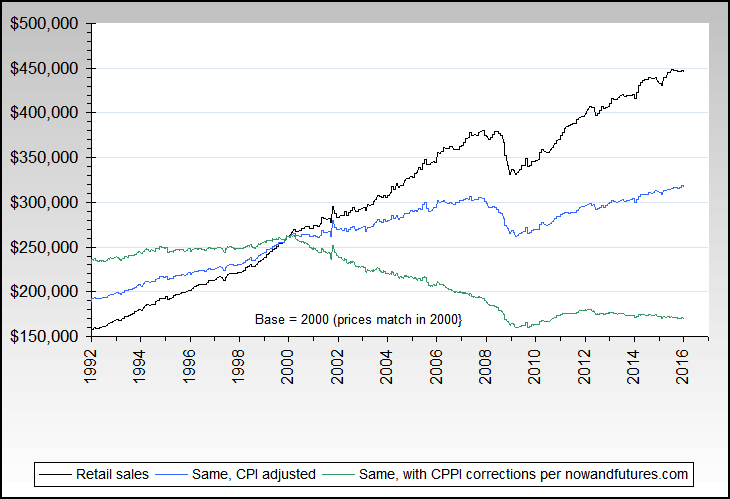 And other calculations reveal how badly OER tracks housing prices over long periods. 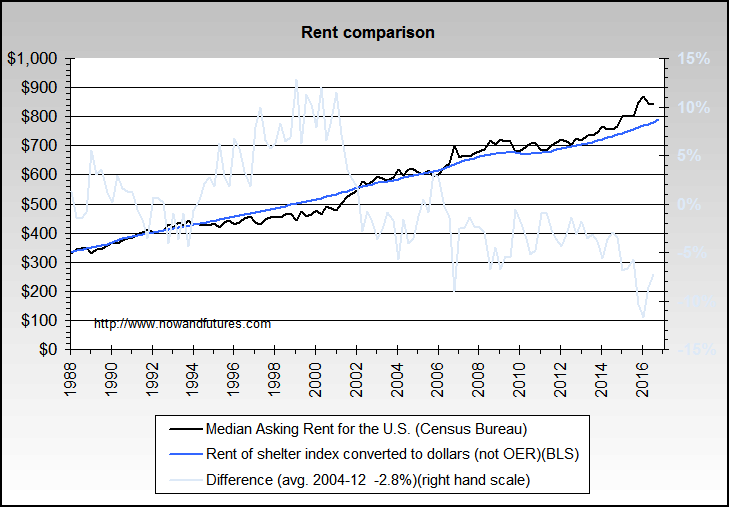 Even the BLS rent index is substantially under reported when compared to Census Bureau data. There are large and similar issues with medical care, etc. too. Employment is trending upward, not down. USIP is actual output. It cannot be deflated as there is nothing to deflate. ISM employment, last three months. Sorry, thought it was clear from context that U was referring to ISM data. Of course, but how many of your hundreds of thousands of stats are dollar or other currency based? I still submit that more are level to down (or negative, like GDP) than up. Non Manufacturing ISM Business Activity/Production Index and NMI Composite both down this morning, both on an absolute basis and on an annual change rate basis. Trends have been down in both since February 2012.